The building is traditionally built and consists of spacious (30 m2) rooms, accommodating 2-3 persons each. Our accommodation at Vaporia offers you much more space than a traditional hotel room. 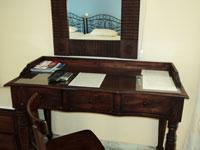 Our delightful studios are nicely decorated, offering a relaxing and cozy atmosphere. Rooms with: sound insulation, marble coated private bathroom, independent air-conditioning, desk, fridge, water boiler and some of them, balcony or yard.